Our superb 18 hole, par 69 golf course opened in 1994, Chobham Golf Club was designed by Peter Allis and Clive Clarke and is laid out on naturally undulating parkland set amongst mature oak woodland giving the impression that the course has been around for many more years. The course provides an excellent challenge to the skills of low and high handicap players alike. Built to Championship standards with USGA greens, the course has automatic irrigation and a drainage system designed to provide excellent year round play. Among the many attractive features of the course are the six strategically placed lakes which come in to play on 9 of the 18 holes. There is a combination of challenging par fours, tempting par five and six superb par threes. The clubs signature hole is the 15th, a 222 yard par 3 nestling in front of the clubhouse terrace. At Chobham we thrive on helping you to create the perfect day and feel that with our experience we can help you achieve that. Our staff are experienced in organising and running golfing events throughout the year. Our attention to detail helps you to professionally organise your event giving all your guests that special sense of occasion from arrival right through to their departure. We can tailor all of our packages to suit your needs and budget. Our Pro-shop offers a range of prizes that can be preordered and will also arrange for Nearest the Pin and Longest Drive markers. freshly prepared by our on-site chef. Winter season November to February Packages start from £30pp. Summer season March to October Packages start from £34pp. We are always happy to discuss tailored requirements to suit individual requirements. Quietly situated on the Chobham Road between Knaphill and the picturesque village of Chobham, with Woking and Camberley both 10 minutes drive away, while Guildford and Staines are approximately 7 miles from the club. 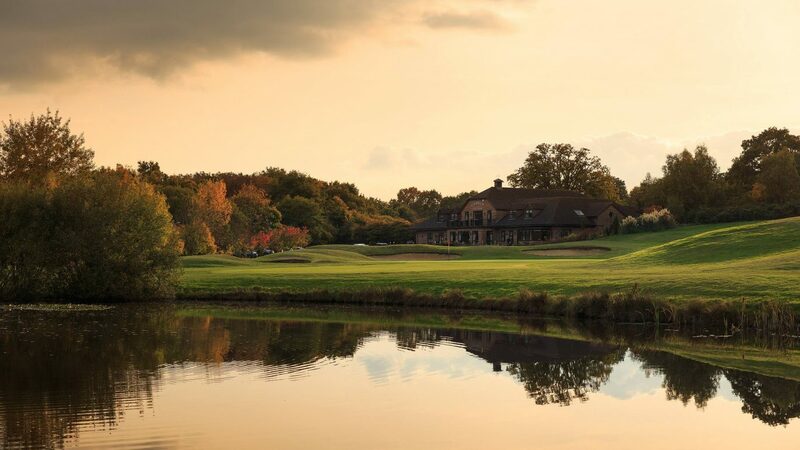 The M3 junction 3 is approximately 4 miles, and M25 junction 12 is approximately 6 miles from the golf club. 18-hole course, open plan club house, bar, outside terrace, function room, pro shop, free WIFI, changing rooms and lockers, meeting room, large car park, putting green and practice nets.